Removing hair from delicate areas such as your bikini line can be tricky. is less expensive than a monthly waxing payment. will target all of the hair, and is less painful than waxing. will, unlike shaving or IPLs, remove the unwanted hair permanently. Say hello to your smoothest bikini line ever. Your bikini line includes 3 gauge-widths (about 2 inches) below the hip crease and one gauge below the hip line. In a fraction of the time, you can say goodbye to blades and hot waxes invading your personal space. The laser targets your hair follicle to eliminate the root of the hair without harming the skin. A quick pulse, a cooling mist, and your hair is destroyed forever (See a demo). The laser targets your hair follicle to eliminate the root of the hair without harming the skin. In a fraction of a second, the laser pulses, and it’s followed by a cooling mist to immediately ease any discomfort With the root of the hair destroyed, it will never regrow so you’re hair-free forever. Treatments are quick and don’t require any time for recovery so you can be treated over lunch and go on with your day. 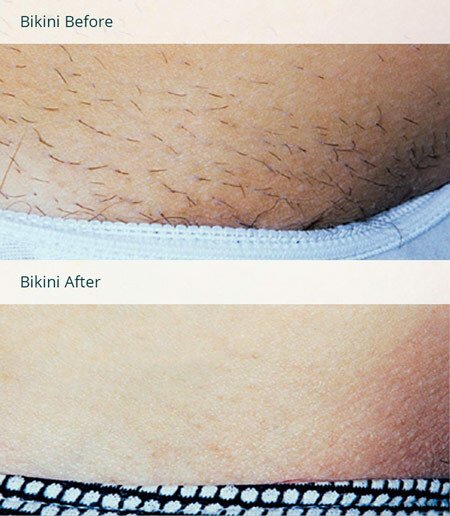 You can shave prior to your treatment, so no need to keep your bikini line wild! The laser is gentle enough to use all over the body, including the sensitive bikini area. Razor bumps and ingrown hairs are a problem of the past with laser hair removal. The delicate skin around your bikini deserves to be treated kindly — don’t torture it with blades and molten wax! Beach Ready. Always. Last minute appointments and the waxing-waddle will be a distant memory. You’ll always be prepared for swimsuit season after laser hair removal. Permanent Results. No more shaving or painful waxing. Ever. Your smooth skin is here to stay. Lifetime Guarantee. Have a rogue hair that didn’t get the memo about being hair free? No problem, you’re covered with Milan! Come in and we’ll take care of it, no questions asked, and no additional cost. Gentle Hair Removal. Because the laser targets the hair follicle, your skin doesn’t suffer through the abrasive action that razors, depilators, or hot waxes can cause so you don’t risk breaking the protective surface of the skin. The laser targets the hair follicle and doesn’t break or harm the protective surface of the skin. Laser hair removal is the best way to remove hair from your bikini area. It’s the safe, and 100% effective process guarantees smooth skin.